This is the kind of magic that surrounds the turmeric – this rather plain root, which only reveals its sensual, red-golden flesh when cut open. Numerous myths have been retained ever since, which explains why the turmeric root is believed to by sacred in India. Wherever her lushes yellow color shines, the gods are put in a favorable mood, and burning the powdery essence is said to keep the evil away. It is brought as a sacrificial offering to the Elephant God Ganesha, as well as it is applied to the bride’s hands to grant her future life with beauty, wealth and fertility. Hardly any other plant contains as many talents and powers inside as the turmeric root. She is one of the oldest spices mankind knows of, which is why she is also known as “the Queen of all spices”. For more then 5000 years she has provided the various Southeastern Asian dishes with their pungent, slightly peppery taste, and she is the most important condiment in the ayurvedic cuisine. But she is so much more than just tasty seasoning and sun yellow dye: She is first and foremost one of the oldest natural remedies with a wide-spread variety of healing powers, which makes her unique across the globe – a remedy physicians and nutritions alike have attributed qualities as effective as any medication but much more tolerable to the system and with hardly any negative side-effects. Today there are numerous medical studies about turmeric and her positive impact on the bodies ability to restore and heal, more of 70 of which currently running in the USA, all of them revealing the fact that her ability to prevent and heal is down to roughly 660 high-potent active substances, particularly the phytochemical “curcumin“. This extraordinary substance has anti-oxidative as well as anti-inflammatory effects to such extent that evidentially it can protect and improve health of literally every single organ in our body. Even more, regular consumption of turmeric can even help prevent serious diseases such as diabetes, heart diseases and cancer. In Ayurveda, the sister discipline of yoga, the effect of turmeric on the digestive system, referred to as agni, is of major importance. If the agni is weak, the person lacks energy, is constantly tired, has digestive issues, and often a tendency to frequently become ill as the immunity system is not functioning optimally. 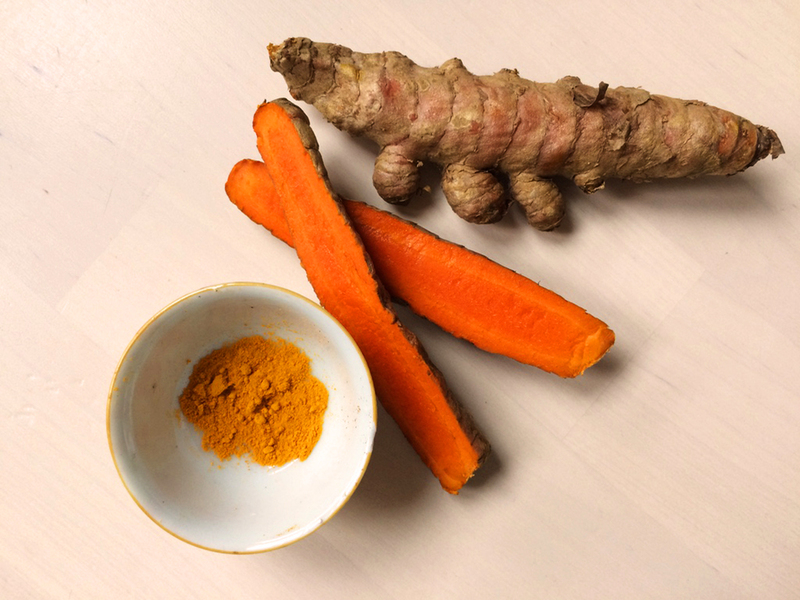 Again, as several studies reveal, the curcumin contained inside the root improves digestion and boosts production of enzymes essential to enable detoxication of the liver. Furthermore, curcumin inhibits unrestrained growth of fungi and bacteria, promotes a healthy concentration and release of bile to stimulate and improve digestion, especially of fat. In traditional Chinese medicine (TCM) besides its healing qualities on the stomach, spleen and entire blood system, curcumin is used to treat rheumatism. Here as well various studies have given evidence that it reduces inflammation, encourages metabolism, purifies the blood, and strengthens the immunity system. Especially effective it has proven to be in treating arthritis in patients. Here the studies revealed that the therapeutic application of curcumin had similar positive effects as the prescribed medication: pain levels were decreased, swelling and inflammation reduced, as well as the unpleasant sensation of heat and burning in the affected joints. Be careful – this will stain everything it gets in touch with, including your sheets and skin, and also the cloth you will use to take it off afterwards. But it’s definitely extremely effective and worth it! Another very effective way to benefit from the healing powers of the turmeric is to drink the “Anti-Inflammatory Turmeric Tonic” for a period of at least 4 weeks. I myself have put myself on a trial, and I have had amazing results with healing my bowels and immunity system. I will write a detailed report about my personal story of healing my Crohn’s Disease very soon! The powers of the turmeric root is even believed to have a healing effect on our soul. In the ancient vedic literature we can find evidence of turmeric increasing ojas, which represents our spiritual energy, as well as gifting us with sattva, which is the ultimate state of harmony and beauty, but also connects us with our origin – the essence of all living creatures. In conclusion, the Indians have granted the turmeric root the name Nisha, which can be translated as “radiantly beautiful as the starry night”. It is a bow to the root, whicht grows in complete darkness deep down in the earth, never touched by the warmth and light of the sun, and yet still holds the power of shining forth of its own accord. Only to pass along this light to us.